Web Address: www.amyandjoanne.com. 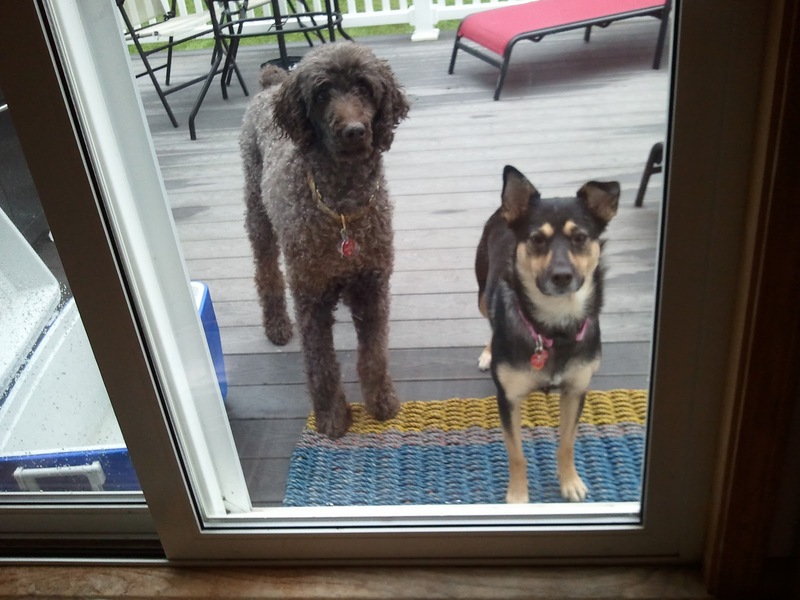 We have dogs on our website! Teddy is a 12 year old standard poodle. We have had him since he was three months old. I call him my grumpy old man. He has no patience for puppies but loves his sister Angel, a two and a half year old shelter pup, a shepherd mix. We have written a novel called Wicked Good. It is the story of a single mom and her 15 year old who has Aspergr’s syndrome, which is a form of autism. The novel is based on myself and my son. Teddy the standard poodle is in love with my son and vice versa. My sister and I are writing a second novel which is called Wicked Wise. I have just finished Garden of Spells, a book for my local library book club. I am about to start reading a novel which my sister has written without me. It is tentatively titled The Lantern. The drafts I have seen of it so far are terrific. I read a lot. I always have two books going. It is hard to say how many I read other than to say it is not enough! Both my dogs are couch potatoes. Teddy, because he is old and has arthritis in his hip and he has a heart issue. Angel, because she is very timid and has been with us for 4 months. I love watching as she is becoming less timid and doing dog stuff - smelling things, jumping for treats, getting the zoomies. They both sit next to me on the couch or my bed or they sit under my desk. Teddy’s favorite activity is searching the house for food left around. He loves to go on walks, especially in the forest behind my house. He loves to hang out with my oldest son, especially if there is food involved! Angel likes to be with me and Teddy. She is happy just being close to me. I am trying hard to minimize her anxiety so that she can enjoy dog things! My favorite activities are hanging out with my dogs and my kids and writing! People frequently ask how it came to be that two sisters wrote a novel together and what it was like to work as a team. The answers are "simple" and "great." It was March. The snow was dirty brown and the sun was absent in Bangor, Maine. Amy was spending a lot of time on her sofa, channel surfing and landing nowhere. Joanne called from her home in Florida. "Wanna write a book together?" Amy wrapped an afghan around her and yawned from lack of blood flow to her brain. "Sure," was the best response she could muster. Amy is a lawyer by day and single mom to two teenage boys by day and night. 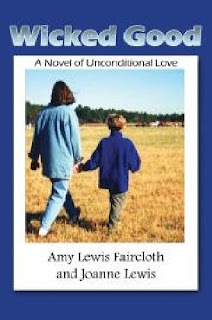 Her oldest is diagnosed with Asperger's syndrome, a form of autism which has been of mixed blessings to her life. Joanne is also a lawyer and the literary brains behind this outfit. Amy can only write based upon her life experiences. Without Joanne moving the plot along, Wicked Good would be nowhere. On the other hand, Amy has the experience. Her son is now 19 years old. Life has been a challenge for both of them. The incidents in the novel Wicked Good are fiction. But many of the characteristics of the mother and son have basis in authenticity. For example, once Amy's son gets an idea in his head, it is tough to dissuade him otherwise. As another example, juggling his needs with Amy's job truly stresses her out and the bathtub is a frequent refuge. However, he has never hit Amy and Amy does not have a drinking problem. Writing Wicked Good together has brought us closer. We are working on the second novel in the series called Wicked Wise. We hope you enjoy Wicked Good. Thank you so much for having Amy on your blog today Mary. I had not heard of her book. I so want to get it now. I am raising Junior until his mother can cope with his autism, (which may be never I know). There are so many emotions that go into it. My fear is that Junior, who sounds a lot like Rory, will hit the same rough patch as a teen. Her book sounds so fascinating to me because the similarities between my situation and the one in her book. Junior wants a relationship with his mom and I am not sure she will be able to give that to him. It is really scary to think of all the ways this can play out. It really is a tightrope walk and some days humor is what keeps me sane. Her dogs are awesome too! Cristina -- thank you so much for your kind words! Those made my day! I hope everything works out for you.